The Sweet Bookshelf: International Prize Pack Giveaway! It has been awhile since we've had a contest here on The Sweet Bookshelf, sorry guys! I'm gonna make it up to you in a big way. I'm giving away a Prize pack! Just enter your name, email, and mailing address in the link below and you'll be entered. If I hit 200 Followers by the end of the contest I will give away 2 prize packs! Tell your friends! Fablehaven- For centuries mystical creatures of all description were gathered into a hidden refuge called Fablehaven to prevent their extinction. The sanctuary survives today as one of the last strongholds of true magic. Enchanting? Absolutely. Exciting? You bet. Safe? Well, actually, quite the opposite. Forest born-Rin is sure that something is wrong with her…something really bad. Something that is keeping her from feeling at home in the Forest homestead where she’s lived all her life. Something that is keeping her from trusting herself with anyone at all. When her brother Razo returns from the city for a visit, she accompanies him to the palace, hoping that she can find peace away from home. But war has come to Bayern again, and Rin is compelled to join the queen and her closest allies—magical girls Rin thinks of as the Fire Sisters—as they venture into the Forest toward Kel, the land where someone seems to want them all dead. Many beloved Bayern characters reappear in this story, but it is Rin’s own journey of discovering how to balance the good and the bad in herself that drives this compelling adventure. The Maze Runner- When Thomas wakes up in the lift, the only thing he can remember is his first name. His memory is blank. But he’s not alone. When the lift’s doors open, Thomas finds himself surrounded by kids who welcome him to the Glade—a large, open expanse surrounded by stone walls.Just like Thomas, the Gladers don’t know why or how they got to the Glade. All they know is that every morning the stone doors to the maze that surrounds them have opened. Every night they’ve closed tight. And every 30 days a new boy has been delivered in the lift.Thomas was expected. But the next day, a girl is sent up—the first girl to ever arrive in the Glade. And more surprising yet is the message she delivers. Thomas might be more important than he could ever guess. If only he could unlock the dark secrets buried within his mind. 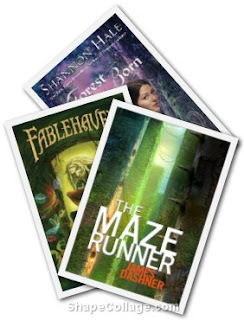 Awesome contest, I would love to read all three of these! Thanks! Great giveaway and book choices! Nice picks!! Thanks for posting the giveaway! Oh I hope I win!! I'm gonna fill in the form. Thanks for making it internationally ! Super great contest! Thanks for making it international!!!! I make it 201! Yay! Two Prize packs!